In this season of madness regarding away jerseys for football teams, ably lead by that ghastly creation Newcastle United will be wearing, is this the new Manchester united away jersey I ask myself. The colour grey has always been a sore point with Fergie ever since the last one they used. They trailed Southampton 3-0 at half time and Fergie ordered that they all take off that grey kit and don the third kit for the rest of the match, which they went on to lose 3-1. Now we have another grey creation manufactured by Nike. The Sky Blue is a nice touch, reminds me of another team with loads of money who can't sign a good player for love nor money, now what's their name ? Hopefully, this is just a training top. 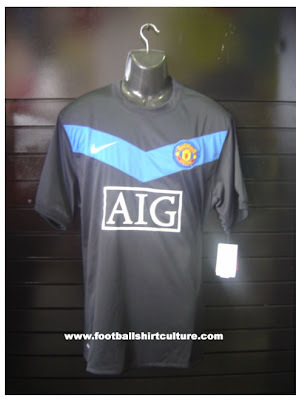 But while we're on the subject of kits - when I heard Nike were going to be Utd's kit supplier I was quite pleased, because Nike always seemed to design nice kits with nice features and details - without getting carried away, and going over the top with regards flamboyance, but I hated the last kit (liked the one before in a darker shade of red) and dislike the new red one. Is it just me or do Nike only seem to design us dodgy strips? the new red kit would have been ten times better if it had a deeper shade of red for the "v" - and to anybody with a modicum of design sense - a "v" neck would have been the obvious design choice to tie-in with the "v" on the chest of the shirt. I'm sure footballers in general would prefer "v" necks to round necks so why do we keep getting round necks? I'm sure there must be a Liverpool supporter at Nike designing us these kits!!! i have to say its pretty ugly, apparently its just a fake from thailand. lets hope so. The kit is just like some Power Rangers kit. I still like the Vodafone jersey last time. Hey Carly, Great blog. I too have a website on Man Utd ( Even i'm crazy abt United). My blogs adress is http://sites.google.com/site/munjanasite. You can see great vids and play fun games. If you want you can place an ad (very cheap) and you will get loads of traffic. To place an ad just click the 'your ad here' link at the bottom of any page. I suggest you also put y u should'nt call United "ManU". I have to be honest. I don't like it.